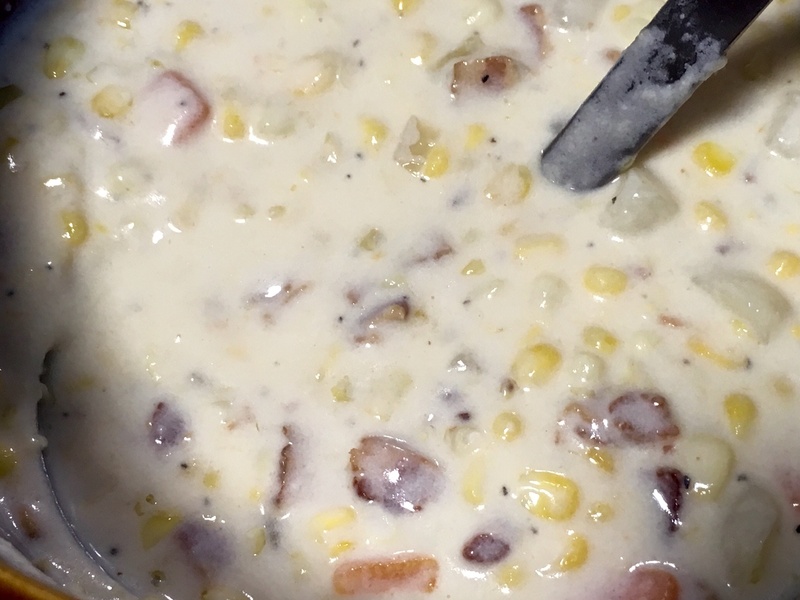 Eileen Beyer’s Indiana Corn Chowder recipe took top honors at the Marion County Fair. I judged the contest — and sampled the chowder — so I can attest to its tastiness. It’s definitely a rich soup, but so good! Cut up bacon in 1/2-inch pieces and fry until very crisp. Remove from grease with slotted spoon, drain on paper towel and set aside. Dice onion and saute in 1 tablespoon of butter; drain and set aside. Peel and cube carrots and potatoes. Partialy cook in boiling salted water; drain and set aside. Place corn in boiling water and steam for 5 minutes. Remove from stove, drain and when cool enough to handle, cut from cob with a sharp knife. Over medium heat, melt stick of butter in large soup pan. Add flour and blend with a fork. Add milk and half and half, stirring occasionally and being careful not to scorch. Let thicken slightly. Add corn, carrots, potatoes and onions to thickened milk. Continue to cook over medium heat until all vegetables are soft. Add salt and pepper and taste, adding additional if necessary. Add bacon last so it stays crisp.